رحمانی, فرهاد, حقیقی, محمد. (1396). تأثیر پایه های زئولیتی گوناگون روی ویژگی ها و عملکرد راکتوری نانوکاتالیست کروم اکسید برای استفاده در فرایند هیدروژن گیری اکسایشی C2H6/CO2. نشریه شیمی و مهندسی شیمی ایران, 36(1), 65-81. فرهاد رحمانی; محمد حقیقی. "تأثیر پایه های زئولیتی گوناگون روی ویژگی ها و عملکرد راکتوری نانوکاتالیست کروم اکسید برای استفاده در فرایند هیدروژن گیری اکسایشی C2H6/CO2". نشریه شیمی و مهندسی شیمی ایران, 36, 1, 1396, 65-81. رحمانی, فرهاد, حقیقی, محمد. (1396). 'تأثیر پایه های زئولیتی گوناگون روی ویژگی ها و عملکرد راکتوری نانوکاتالیست کروم اکسید برای استفاده در فرایند هیدروژن گیری اکسایشی C2H6/CO2', نشریه شیمی و مهندسی شیمی ایران, 36(1), pp. 65-81. رحمانی, فرهاد, حقیقی, محمد. تأثیر پایه های زئولیتی گوناگون روی ویژگی ها و عملکرد راکتوری نانوکاتالیست کروم اکسید برای استفاده در فرایند هیدروژن گیری اکسایشی C2H6/CO2. نشریه شیمی و مهندسی شیمی ایران, 1396; 36(1): 65-81. در این پژوهش، امکان به­کارگیری پایه­های زئولیتی و تأثیر نوع­های گوناگون آن بر روی ویژگی­های کاتالیستی و عملکرد راکتوری نانوکاتالیست کروم اکسید برای استفاده در فرایند هیدروژن­گیری اکسایشی اتان به کمک کربن دی اکسید مورد ارزیابی قرار گرفت. در این راستا، شماری از کاتالیست­های کروم اکسید دارای 4/3 % وزنی کروم با تلقیح پایه­های زئولیتی انتخاب شده کلینوپتیلولیت، SAPO-34 و HZSM-5 تهیه شدند. بدین منظور، کلینوپتیلولیت خریداری شد و پایه­های SAPO-34 و HZSM-5 به روش هیدروترمال تهیه شدند که آنالیزهای XRD، FESEM، BET و EDX تهیه موفقیت آمیز آن­ها را تأیید کردند. تصویرهای FESEM تشکیل کلوخه­های کم­تر و پراکندگی بهتر نانوذره­های سطحی بر روی ذره­های مکعبی شکل ZSM-5 را در مقایسه با دیگر پایه­های زئولیتی تأیید کردند. نتیجه­های آنالیز TPD-NH3نشان داد که با به­کارگیری پایه کلینوپتیلولیت دستیابی به ویژگی­های اسیدی بهتری در مقایسه با دیگر پایه­های زئولیتی امکان­پذیر می­باشد که به پایداری بالای کاتالیست کمک شایانی می­کند. بر اساس نتیجه­های آنالیز EDX، به­کارگیری پایه­های تهیه شده به­ویژه HZSM-5 به دلیل سطح ویژه بالا سبب توزیع بهتر ذره­های کروم می­شود که وجود ذره­های کروم فعال (اکسایشی-کاهشی) بیش­تر بر روی سطح HZSM-5 را نوید می­دهد و این امر در کنار نانوذرات سطحی یکنواخت و تشکیل کلوخه­های کم­تر در کاتالیست تهیه شده از دلیل­های کارآیی به­تر نانوکاتالیست Cr/ZSM-5 برشمرده می­شود. براساس نتیجه­های ویژگی­سنجی، سطح ویژه پایین و توزیع نامناسب ذره­های کروم در کاتالیست Cr/Clinotilolite و پوشش سطحی و بسته شدن حفره­های SAPO-34 در کاتالیست Cr/SAPO-34 از دلیل­های اصلی پایین بودن بازدهی این کاتالیست­ها در مقایسه با به­کارگیری پایه ZSM-5 می­باشند. دیده شد که نانوکاتالیست Cr/ZSM-5 با بازده تولید اتیلن 4/45 % به­خوبی اتان را در حضور CO2 و در دمای 700 به اتیلن تبدیل می­کند. رسوب کک در نتیجه وجود سایت­های اسیدی قوی عامل اصلی روند کاهشی دیده شده برای فعالیت کاتالیست Cr/ZSM-5 با گذشت زمان می­باشد. Michorczyk P., Ogonowski J., KuÅ›trowski P., Chmielarz L., Chromium Oxide Supported on Mcm-41 as a Highly Active and Selective Catalyst for Dehydrogenation of Propane with CO2, Applied Catalysis A: General, 349(1-2): 62-69 (2008). Michorczyk P., Ogonowski J., Zeńczak K., Activity of Chromium Oxide Deposited on Different Silica Supports in the Dehydrogenation of Propane with CO2 - a Comparative Study, Journal of Molecular Catalysis A: Chemical, 349(1-2): 1-12 (2011). Michorczyk P., Pietrzyk P., Ogonowski J., Preparation and Characterization of Sba-1-Supported Chromium Oxide Catalysts for CO2 Assisted Dehydrogenation of Propane, Microporous and Mesoporous Materials, 161: 56-66 (2012). Mimura N., Takahara I., Inaba M., Okamoto M., Murata K., High-Performance Cr/H-Zsm-5 Catalysts for Oxidative Dehydrogenation of Ethane to Ethylene with CO2 as an Oxidant, Catalysis Communications, 3(6): 257-262 (2002). Shi X., Ji S., Wang K., Oxidative Dehydrogenation of Ethane to Ethylene with Carbon Dioxide over Cr-Ce/SBA-15 Catalysts, Catalysis Letters, 125(3-4): 331-339 (2008). Takehira K., Ohishi Y., Shishido T., Kawabata T., Takaki K., Zhang Q., Wang Y., Behavior of Active Sites on Cr-MCM-41 Catalysts During the Dehydrogenation of Propane with CO2, Journal of Catalysis, 224(2): 404-416 (2004). Wang S., Murata K., Hayakawa T., Hamakawa S., Suzuki K., Dehydrogenation of Ethane with Carbon Dioxide over Supported Chromium Oxide Catalysts, Applied Catalysis A: General, 196(1): 1-8 (2000). Wang D., Xu M., Shi C., Lunsford J.H., Effect of Carbon Dioxide on the Selectivities Obtained During the Partial Oxidation of Methane and Ethane over Li+/MgO Catalysts, Catalysis Letters, 18(4): 323-328 (1993). Kong L., Li J., Zhao Z., Liu Q., Sun Q., Liu J., Wei Y., Oxidative Dehydrogenation of Ethane to Ethylene over Mo-Incorporated Mesoporous SBA-16 Catalysts: The Effect of Moox Dispersion, Applied Catalysis A: General, 510: 84-97 (2016). Ishchenko E.V., Kardash T.Y., Gulyaev R.V., Ishchenko A.V., Effect of K and Bi Doping on the M1 Phase in MoVTeNbO Catalysts for Ethane Oxidative Conversion to Ethylene, Applied Catalysis A: General, 514: 1-13 (2016). Elbadawi A.H., Ba-Shammakh M.S., Al-Ghamdi S., Razzak S.A., Reduction Kinetics and Catalytic Activity of VOx/Γ-Al2O3-ZrO2 for Gas Phase Oxygen Free ODH of Ethane, Chemical Engineering Journal, 284: 448-457 (2016). Cheng Y., Zhang F., Zhang Y., Miao C., Hua W., Yue Y., Gao Z., Oxidative Dehydrogenation of Ethane with CO2 over Cr Supported on Submicron ZSM-5 Zeolite, Chinese Journal of Catalysis, 36(8): 1242-1248 (2015). Talati A., Haghighi M., Rahmani F., Oxidative Dehydrogenation of Ethane to Ethylene by Carbon Dioxide over Cr/TiO2-ZrO2 Nanocatalyst: Effect of Active Phase and Support Composition on Catalytic Properties and Performance, Advanced Powder Technology, 27(4): 1195-1206 (2016). Zhang F., Wu R., Yue Y., Yang W., Gu S., Miao C., Hua W., Gao Z., Chromium Oxide Supported on ZSM-5 as a Novel Efficient Catalyst for Dehydrogenation of Propane with CO2, Microporous and Mesoporous Materials, 145(1-3): 194-199 (2011). Setnička M., Bulánek R., Čapek L., Čičmanec P., N-Butane Oxidative Dehydrogenation over VOx-HMS Catalyst, Journal of Molecular Catalysis A: Chemical, 344(1-2): 1-10 (2011). Madeira L.M., Portela M.F., Catalytic Oxidative Dehydrogenation of N-Butane, Catalysis Reviews, 44(2): 247-286 (2002). Asghari E., Haghighi M., Rahmani F., CO2-Oxidative Dehydrogenation of Ethane to Ethylene over Cr/MCM-41 Nanocatalyst Synthesized Via Hydrothermal/Impregnation Methods: Influence of Chromium Content on Catalytic Properties and Performance, Journal of Molecular Catalysis A: Chemical, 418-419: 115-124 (2016). Liu L., Li H., Zhang Y., A Comparative Study on Catalytic Performances of Chromium Incorporated and Supported Mesoporous MSU-X Catalysts for the Oxidehydrogenation of Ethane to Ethylene with Carbon Dioxide, Catalysis Today, 115(1-4): 235-241 (2006). Asgari N., Haghighi M., Shafiei S., Synthesis and Physicochemical Characterization of Nanostructured Pd/Ceria-Clinoptilolite Catalyst Used for P-Xylene Abatement from Waste Gas Streams at Low Temperature, Journal of Chemical Technology and Biotechnology, 88(4): 690-703 (2013). Vafaeian Y., Haghighi M., Aghamohammadi S., Ultrasound Assisted Dispersion of Different Amount of Ni over Zsm-5 Used as Nanostructured Catalyst for Hydrogen Production Via CO2 Reforming of Methane, Energy Conversion and Management, 76: 1093-1103 (2013). Rahmani F., Haghighi M., Vafaeian Y., Estifaee P., Hydrogen Production via CO2 Reforming of Methane over ZrO2-Doped Ni/ZSM-5 Nanostructured Catalyst Prepared by Ultrasound Assisted Sequential Impregnation Method, Journal of Power Sources, 272: 816-827 (2014). Mimura N., Okamoto M., Yamashita H., Oyama S.T., Murata K., Oxidative Dehydrogenation of Ethane over Cr/ZSM-5 Catalysts Using CO2 as an Oxidant, The Journal of Physical Chemistry B, 110(43): 21764-21770 (2006). Shen Z., Liu J., Xu H., Yue Y., Hua W., Shen W., Dehydrogenation of Ethane to Ethylene over a Highly Efficient Ga2O3/HZSM-5 Catalyst in the Presence of CO2, Applied Catalysis A: General, 356(2): 148-153 (2009). Lisi L., Marchese L., Pastore H.O., Frache A., Ruoppolo G., Russo G., Evaluating the Catalytic Performances of SAPO-34 Catalysts for the Oxidative Dehydrogenation of Ethane, Topics in Catalysis, 22(1-2): 95-99 (2003). Marchese L., Frache A., Gatti G., Coluccia S., Lisi L., Ruoppolo G., Russo G., Pastore H.O., Acid SAPO-34 Catalysts for Oxidative Dehydrogenation of Ethane, Journal of Catalysis, 208(2): 479-484 (2002). Botavina M.A., Martra G., Agafonov Y.A., Gaidai N.A., Nekrasov N.V., Trushin D.V., Coluccia S., Lapidus A.L., Oxidative Dehydrogenation of C3-C4 Paraffins in the Presence of CO2 over CrOx/SiO2 Catalysts, Applied Catalysis A: General, 347(2): 126-132 (2008). Çulfaz M., Yağız M., Ion Exchange Properties of Natural Clinoptilolite: Lead-Sodium and Cadmium-Sodium Equilibria, Separation and Purification Technology, 37(2): 93-105 (2004). Garcia-Basabe Y., Rodriguez-Iznaga I., de Menorval L.-C., Llewellyn P., Maurin G., Lewis D.W., Binions R., Autie M., Ruiz-Salvador A.R., Step-Wise Dealumination of Natural Clinoptilolite: Structural and Physicochemical Characterization, Microporous and Mesoporous Materials, 135(1-3): 187-196 (2010). Leung S., Barrington S., Zhao X., El-Husseini B., Effect of Particle Size on Physio-Chemical Properties of Clinoptilolite as Feed Additive, Microporous and Mesoporous Materials, 95(1-3): 48-56 (2006). Liu G., Tian P., Li J., Zhang D., Zhou F., Liu Z., Characterization and Catalytic Properties of SAPO-34 Synthesized Using Diethylamine as a Template, Microporous and Mesoporous Materials, 111(1-3): 143-149 (2008). Izadbakhsh A., Farhadi F., Khorasheh F., Sahebdelfar S., Asadi M., Feng Y.Z., Effect of SAPO-34's Composition on Its Physico-Chemical Properties and Deactivation in MTO Process, Applied Catalysis A: General, 364(1-2): 48-56 (2009). 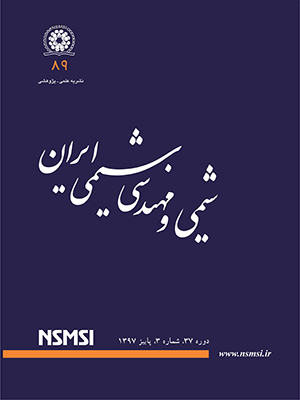 Emrani P., Fatemi S., Ashraf Talesh S., Effect of Synthesis Parameters on Phase Purity, Crystallinity and Particle Size of SAPO-34, Iranian Journal of Chemistry and Chemical Engineering (IJCCE), 30(4): 29-36 (2011). صادقپور پ., حقیقی م., بررسی تأثیر غلظت منگنز و نیکل در سنتز کاتالیست نانوساختار MnNiAPSO-34 برای تبدیل متانول به الفین های سبک, نشریه شیمی و مهندسی شیمی ایران, (1)34 : 11 تا 27 (1394). Durgakumari V., Subrahmanyam M., Subba Rao K.V., Ratnamala A., Noorjahan M., Tanaka K., An Easy and Efficient Use of Tio2 Supported Hzsm-5 and TiO2+HZSM-5 Zeolite Combinate in the Photodegradation of Aqueous Phenol and P-Chlorophenol, Applied Catalysis A: General, 234(1-2): 155-165 (2002). Carrero A., van Grieken R., Paredes B., Hybrid Zeolitic-Mesostructured Materials as Supports of Metallocene Polymerization Catalysts, Catalysis Today, 179(1): 115-122 (2012). فیروزی م., بقالها م., اسدی م., سنتز زئولیت ZSM-5 به عنوان کاتالیست فرایند تبدیل متانول به پروپیلن, نشریه شیمی و مهندسی شیمی ایران, (2)31 : 21 تا 26 (1391). Jansson I., Suárez S., Garcia-Garcia F.J., Sánchez B., Zeolite-Tio2 Hybrid Composites for Pollutant Degradation in Gas Phase, Applied Catalysis B: Environmental, 178: 100-107 (2015). Salem A., Akbari Sene R., Removal of Lead from Solution by Combination of Natural Zeolite-Kaolin-Bentonite as a New Low-Cost Adsorbent, Chemical Engineering Journal, 174(2-3): 619-628 (2011). Izadbakhsh A., Farhadi F., Khorasheh F., Sahebdelfar S., Asadi M., Yan Z.F., Key Parameters in Hydrothermal Synthesis and Characterization of Low Silicon Content SAPO-34 Molecular Sieve, Microporous and Mesoporous Materials, 126(1-2): 1-7 (2009).